PARIS (CNS) — France’s Catholic bishops have published a report on measures to combat sexual abuse by clergy, listing data on criminal charges and efforts by a new anti-abuse commission. “The journey to zero tolerance has begun in a firm and visible way,” Bishop Luc Crepy of Le Puy-en-Velay, head of the French church’s permanent commission for fighting pedophilia, said in his introduction. He said national and local church officials were working on materials to encourage “accepting and listening to victims, facilitating denunciation of criminal pedophilia” and pursuing its perpetrators in the courts. The report was published Oct. 30 as retired Bishop Andre Fort of Orleans became the first French church leader to go on trial for alleged failure to report abuse by clergy. The report said the bishops’ conference had launched its independent anti-abuse commission in April 2016, along with a website for victims and 71 diocesan centers, which had trained up to 8,000 priests, seminarians and lay Catholics in prevention. The report added that in 2017-2018, 211 victims came forward, mostly citing historic abuse, while 75 cases were passed to prosecutors and 49 clergy were suspended from ministry; 10 of those suspended remained under criminal investigation. 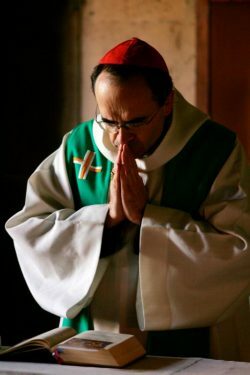 However, victim groups have complained of insufficient action by the church, whose primate, Cardinal Philippe Barbarin of Lyon, faces a criminal trial in January on charges of failing to discipline a local priest, Father Bernard Preynat, who abused children while running a scout group in the 1980s. A Lyon priest, Father Pierre Vignon, whose petition demanding the cardinal’s resignation has been signed by more than 100,000 people, told French newspapers Oct. 31 he had recently been dismissed as a judge on Lyon’s interdiocesan tribunal. Meanwhile, Bishop Fort, 83, faces up to three years in jail for failure to report sexual attacks on boys by another priest, Father Pierre de Castelet. Abuse victims have been invited to a Nov. 3-8 plenary of the 118-member bishops’ conference at Lourdes, although France’s best-known victims’ group, La Parole Liberee, has refused to take part. A cross-party motion for a parliamentary inquiry into sexual abuse in the Catholic church was voted down by the French Senate Oct. 17.